「Featured post」~「TGIF!」Idol♥’s unzipped on way back Fridays~ presents Qlair (Volume 29) | モーニングBerryz48…the morning after….. "Always wear protection before reading…(^q^)." Idols♥ very much like beauty while timeless go through fashion trends and the like being a sign of the times and with each post presented here each Friday I’ll be selecting a few articles to scan or sharing old clips to give a visual and text so you’ll be able to see the ever changing evolution of idols♥ over the years. Check in each Friday for more from this ongoing series =). Qlair, a wonderful part of the legendary Otomejuku idol phenomenon and a great testament to Momusu & H!P’s longevity can be really further appreciated when you examine other idol groups which boomed from the late 80’s into the mid 90’s, many of which held tenures lasting no more than 5 years and often times far shorter than that. What the numbers don’t share though is the high quality of the music produced in these sometimes brief J-Pop careers and Qlair is a great example of just that! 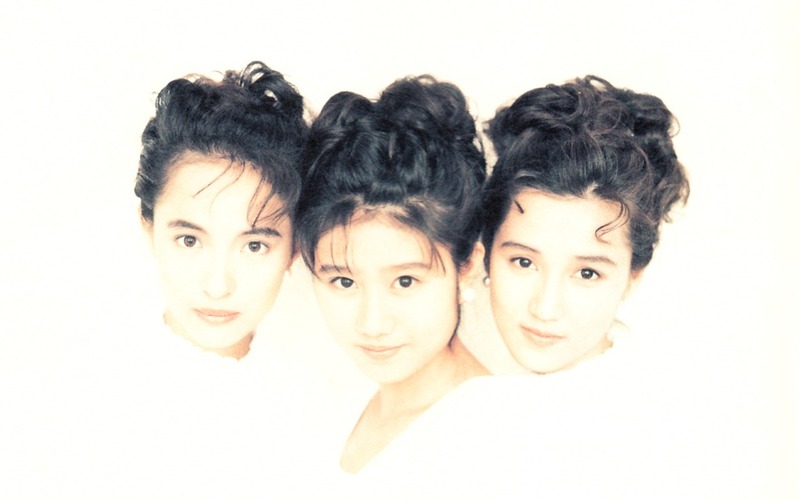 Qlair existed in a time when other much more visible and far more successful idol groups thrived on the J-Pop landscape and theirs is a brief stay which lasted from 1991-1993 and produced 4 albums, 7 singles, and 2 video releases. 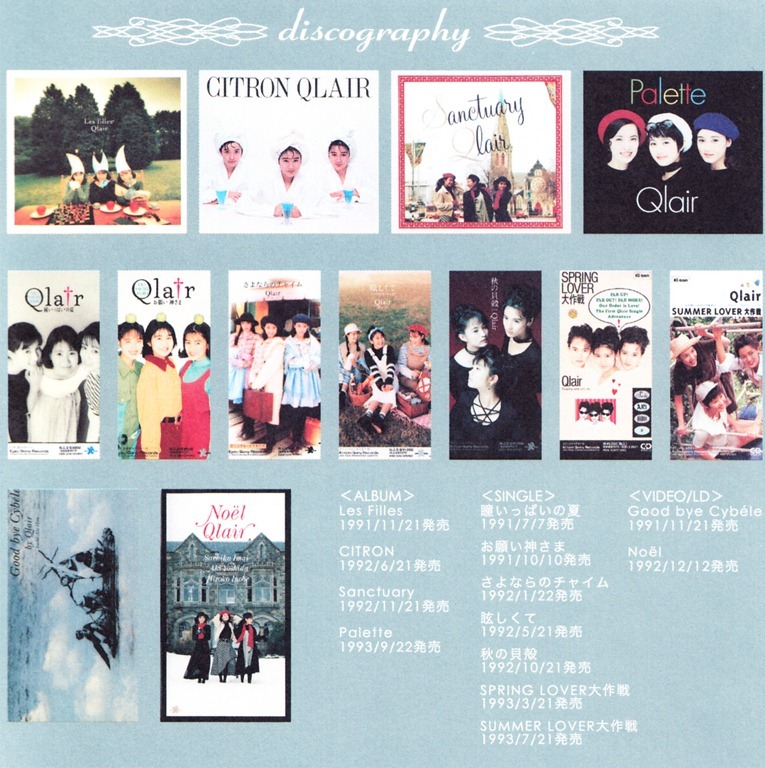 In 2005 Sony would revisit Qlair’s catalog and release “Qlair Archives”, a comprehensive collection containing 3 CDs & a DVD which can be ordered here. And this time period is going way back to before I was even aware of what J-Pop was or owned any or could afford any…well you get the picture ( I was 10 🙂 )…so the whole of this has been a backtracking of sorts through J-Pop history for me. I think it’s always great to hear how music has evolved over time and this is really true of all genres out there. One aspect of the groups back then that is very notable is the high standard and requirements of vocal ability above all else as would seem to be the case with most of these groups when you hear them in vast amounts. A shift of sorts has occurred since where vocal ability isn’t pushed any where nearly as hard for the most part and entrance into an idol group is more of a balance between appearances and ability. Not bad…not better…just a different approach. To give you a brief taste of the high quality of songwriting that Qlair like so many other idol groups during this period enjoyed, I’ve included 3 of my favorite songs from their catalog, 2 of which were released as singles. I’ll start off with the nicely energized track “Yakusoku” (“Promise”). 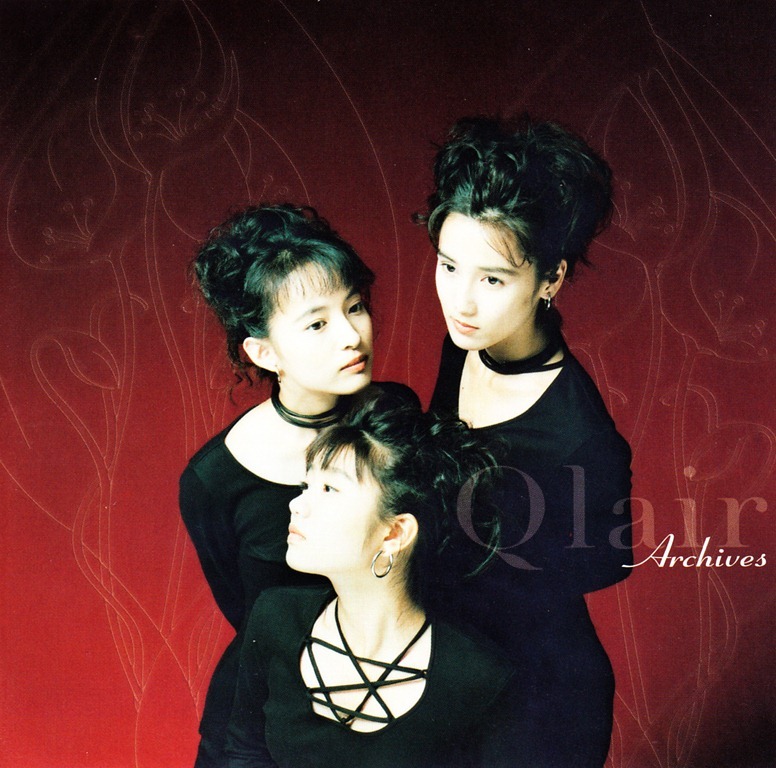 This song represents a perfect example of the sound which J-idol groups embraced back then and take note of the layered harmonies, superb song writing, and overall strong vocals all of which Qlair embodies so well as this is true of all 3 tracks being presented here. And if you’re newer to J~pop you’ll also recognize how this style born through the 80’s also embodies much of AkiP’s productions through AKB48. “Sayonara no chime” is Qlair’s 3rd single release and it’s an extremely sweet mid tempo pop song which serves as a possibly even greater showcase for their vocal talent and its chorus really soars in a beautiful blend of their 3 unique voices all of which shine so strongly here! 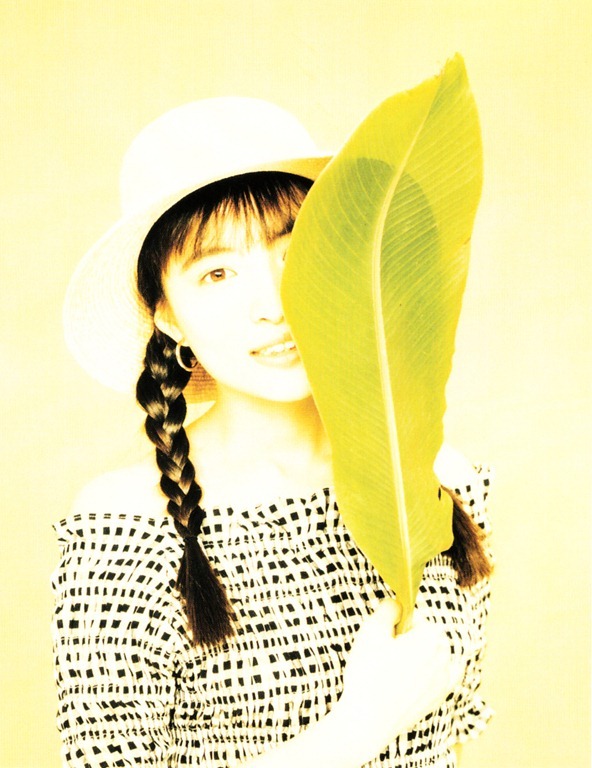 “Sayonara no chime”was released on January 22nd, 1992. I’ve also added a couple of clips from Qlair’s “Good bye Cybele” video release which was issued on DVD in their “Archive” release. The first clip is for their debut song “Hitomi ippai no natsu” and it’s a bit of an unusual one in that the music suddenly stops just after the mid break and the video from there continues with a theme that this video release was following as it’s sort of a “musical” story I guess I would call it. It is a bit odd though as you can watch Qlair build themselves a raft and sail away to a “mysterious” island which kind of looks like a giant rock mountain in the middle of the ocean…where’s the Rock when you need him the most!! Anyway enjoy the music up until that point! 😛 (Released on July 7th, 1991). This entry was posted in Featured, Idols♥ unzipped, J~Pop and tagged hitomi ippai no natsu, idols♥ unzipped, imai sachiko, inobe hiroko, j-pop, onegai kamisama, qlair, sayonara no chime, yakusoku, yoshida aki. Bookmark the permalink. This another great post about a group from a great era. Qlair are fabulous. Have you found any more CDs since writing this? While I’ve been able to get hold of CoCo albums, I’ve found hardly any Qlair or Wink. And trying to search for Ribbon is impossible as you end up looking at, well…ribbons! Were Qlair’s releases all on CD, or were there vinyl releases too? I’ve also found Yukiko Okada releases impossible to find. I presume that whoever owns copies treasures them far to much to consider parting with them. I know I wouldn’t. This is amazing!!!!! You’ve no idea of how happy I am to have met you!!!! We have so much idol favorites in common and now I have someone to speak to and share about the golden age of J-pop!! And getting back to Qlair I’m not sure if their singles were on vinyl..I’ve only seen them on 3 inch CD singles so far, during that era though the vinyl singles were still being produced in Japan as I do have Sakai Noriko’s complete discography and I mean everything by her and she did release 45’s back then which I found at a used record store in Japan. Princess Princess did have vinyl 45s too back then during that time so it’s possible that Qlair had them too, but I just haven’t seen them before. I do have a couple of Otomejuku CD album collections which have the soloist tracks too as CoCo, Ribbon and Qlair weren’t alone and maybe I could post those on a future “Idols♥ Unzipped” here? I do them every Friday so I could put those up here too. Yes, you’re so right about AKB songs echoing this period. ‘Straight’ is such a lovely album (I found a copy with the extra sepia coloured photos): you feel like hugging the CD player when it’s playing! Everything is just right: the voices, the mood of the songs, the accompaniment. It sounds really fresh and beyond changing fashion, too. In a way the 48s manage to be modern and fresh-sounding while having little to do with current listening fashion: many of the songs could have been written decades earlier. It borrows whatever it wants when required to. (I’ve yet to work out what the wonderful ‘Wagamama Collection’ actually is: it uses a familiar rock’n’roll chord sequence from days of yore, but has other borrowings in the mix. )The 48 stage costumes are not often like street fashion, but somehow manage to seem up-to-date at the same time (the ‘Heavy Rotation’ uniform is inspired: military style plus skirt, which is how the girl’s police uniforms in the first ‘Gingham Check’ video are styled). Plus the target audience seems to be…well, everyone: male, female, young, old, not some narrow demographic. One of CoCo best I agree! Oh you got Straight’s first pressing too with the post card set of the girls \(^o^)/!! It’s silly but I have 3 copies of Straight all because I really really wanted those post cards and the first two copies I got didn’t have them =P. I remember way back when I was first learning about CoCo one of my friend’s tests was to use the song “Itte shimatta bus” from “Straight” and I’d need to name each girl’s voice correctly in the song. What’s wonderful about this song is that each girl sings totally solo a section of the song one by one with no ensemble vocals at all appearing. My favorites from Straight are: Naze, Moonlight Express, Kimagure Swing, Circus Game and Wedding lol that’s nearly the entire album. Probably one of the group’s strongest albums next to “Share” I think but every album is excellent! That’s putting it perfectly! How AKB relates and has transcended time merging two eras of music together seamlessly. A~h you’re a musician =D!! I wish I could play the piano but I’m about as far from being ambidextrous as one could be xD. I used to play guitar but just a little…the styling of Heavy Rotation was awesome I was imagining it to be a bit Sgt. Pepper meets idols =P. Ohhh Gingham Check is one of my most favorite videos of all time!!! It’s such an amazing little movie and so so creative utilizing all of those different genres!!! The choreography awesome too!! And of course the song itself top notch!! U~n AKB has amassed the masses with all demographics finding something to love in them for sure. Some of the songs on ‘Strawberry’ sound like the inspiration for dozens of AKB songs, which sets me wondering if AkiP’s composers are given some sort of ‘make it sound like this’ instructions when they are handed the lyrics (I assume the songs are written lyrics first). By the way, I’ve managed to get hold of ‘Belong to You’, but not ‘Kiss’ so far (it’s out there somewhere!). I really enjoy both Gingham Check videos, but have to say that my preference is for the second. The first is huge fun, but the second has a feel-good story that appeals to me, and lovely performances from Mayuyu and Yuuko, who has an amazingly expressive face. I was so pleased when I found the subbed version of the video and was able to understand her voiceover. I finally found someone whom agrees with me =D!…CoCo really does hold a direct inspiration for AKB it’s so true. There must be some sort of way in which the composers are hearing these gems from the late 80’s through the early 90’s when they write new songs I’m sure of it, the structure and similarities are too uncanny. 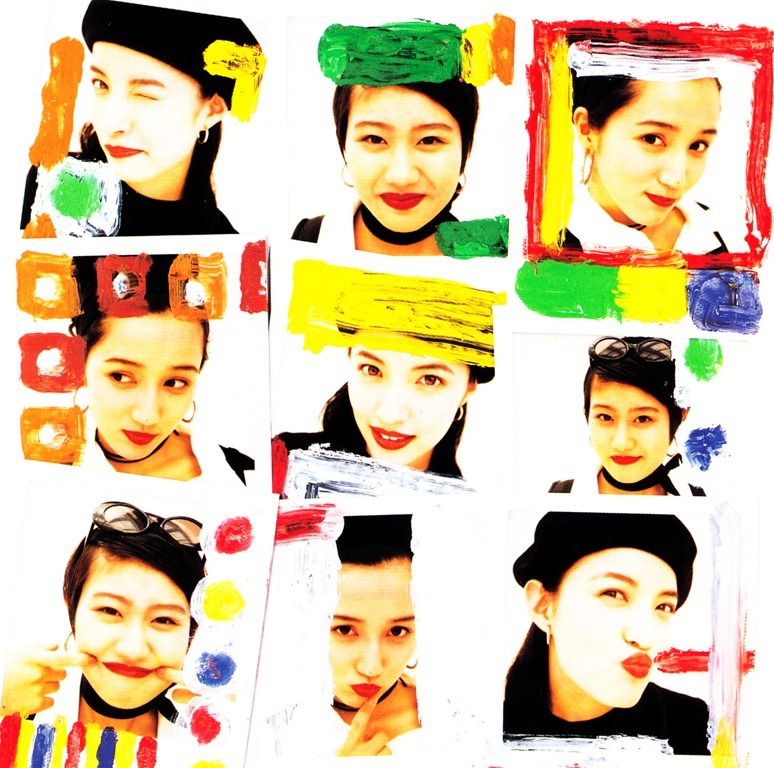 Rieko’s first solo album!…it’s one of the best mini albums too. Her voice is just the cutest isn’t it!…just amazing that someone could be born with those tones in them. 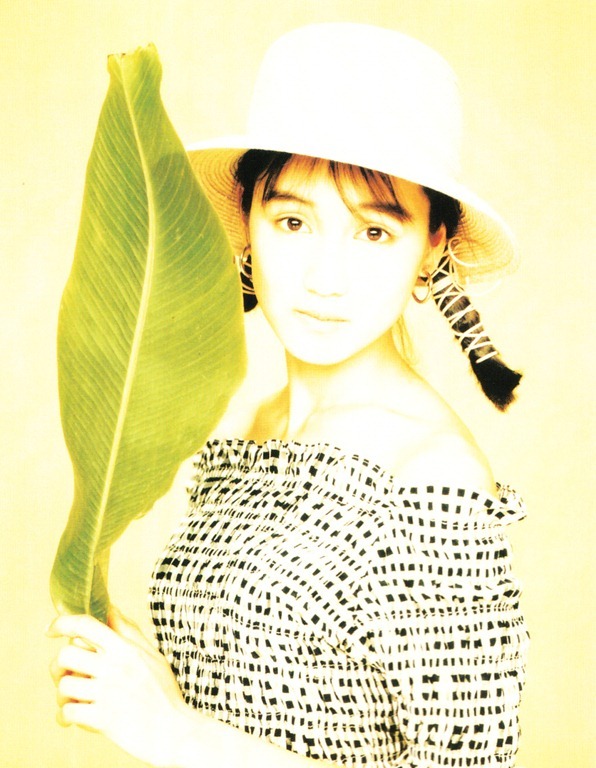 Have you watched Rieko’s first concert “Belong to you?”, “Rieko’s vacation” is great too! I love that CoCo throughout their career had the very same band on stage with them always for their concerts! I bet Otokichi could find for you her “Kiss” album just be sure that you ask if he can find you a first press copy which includes the photo cards inside =). No, I’ve not watched her concert. I wonder if it’s on YouTube or somewhere. I’ll do a search. I’ll probably stand a better chance if I search using her name kanji. I’d really like to know more about the people who wrote the music during this period, but I expect I’ll have to wait until I can read Japanese fluently for that. There must be so much more about this wonderful music on the Japanese sites. It’s a good incentive to keep memorising kanji! I could be wrong, but I thought Yuko started to look quite ill a short while back, as if she needed a good holiday, but she appears much more chipper these days. My only reservation about the first Gingham Check mini movie is that the different story strands, brilliant though they are, didn’t come together at the end,so that they were just running side by side (or have I missed something that’s staring me in the face?!). But it looks amazing, with the various genres convincingly done. There’s even a genuine scary moment for first time viewers when Mayuyu (I think) is grabbed by the ghost. Well, it made me jump anyway. She released three concerts (pictured also on the Miura Rieko post here) however only the first two may be worth getting: “Belong to You” and “Rieko’s Vacation.” Her live at on Air East wasn’t quite as good and that’s coming from one of her biggest fans xD…it’s just that somehow her vocals weren’t doing too well on that night for some odd reason which I’ll never be able to understand as since even that concert she’s appeared on Yoru mo Hit Parade and other variety programs as well as released more music and her voice is just fine as always…it’s just odd watching that concert for that reason. My friends and I would notice that CoCo and their solo works would feature regularly returning lyricist as well as music composers so they did have a sort of regular connection with particular song writers for parts of their careers although not all of it. At times whenever I listen to AKB songs I imagine that the same person(s) wrote their songs as they did CoCo all of those years ago but I haven’t found a connection just yet. Although there are tons, a perfect example that always strikes me as being 100% CoCo like would be SKE48’s song “Wimbledon e tsureteitte”…it’s uncanny and even where the wota cheers appear is so CoCo concert like to a tee. I regularly read Yuko’s blog..didn’t notice anything happening with her but it’s very possible that she was fatigued maybe from so much group and personal activity within AKB48 I wonder? U~n Gingham Check was quite random with the genres and they didn’t connect necessarily, but it’ just so wildly fun and entertaining how they play up so many different roles all playing parallel to each other =). A~h the Mayuyu horror part was awesome and I especially loved how they incorporated the zombie~dance into the song too…so cool! If Circus Game is the 7th track, and I think it is, that’s the one I play about 5 times in a row before moving on to track 8! It’s gorgeous. U~n it’s track 7 love that song so much too! Music was just so well written back then..same can be said for American music. It’s like the past was too great in music and now it’s difficult to live up to that standard or so it seems. Thank goodness for producers with that vision, daring and passion for the past like AkiP. I was really surprised when I got hold of a David Bowie songbook and looked at the music for the early songs such as Life on Mars etc. They are rich in chord changes, and the melodies are beautifully shaped. You can see the influence on him from such singers as the Belgian Jaques Brel. Early Elton John is very inventive too: he strayed into the middle-of-the-road in the 80s. There’s a fair bit of interesting songwriting and singing coming from the American indie/Country crossover artists. But the most exciting music making seems to be happening in Japan. Song is well and truly alive and kicking there. David Bowie is incredible!! He has so many memorable songs that everyone readily knows…agree just amazing song writing. U~n I have most of my favorite early Elton John songs from his compilations, the first three are amazing. That’s so awesome you love country music too!…I love the storytelling especially and a lot of those songs have such a warmth about them with such a real down to earth vibe. I so agree…Japan has the edge and my heart and my wallet now when it comes to music ^^. A forgot to mention, a big part of what attracted me to AKB songs is just how much they emulate this period of groups we’re speaking of here….so much of CoCo’s style of songs especially can be heard in AKB songs and their choreography too, as so many of the same dance moves are seen in AKB music videos and live concerts as how CoCo performed back then it’s uncanny. I did that too. I looked on Amazon and eBay and only found Ribbons you can tie. CD Japan had what I needed though. Thank you. I majored in the wrong field. It’s a wonderful online service, although the terrible exchange rate has ruined the fun for the time being. mb introduced me to the site a while back. That was the link to the Qlair page. Masa sells many, many other CDs and records. Brilliant condition, too. A grading of b- is probably the equivalent of ‘mint’ from the average UK eBay seller. Shame about the GBP/Yen, but hopefully it will return to something approaching the ¥170 per £ that is was a while back, rather than the post-Brexit ¥127 it is today. Thanks. Looks like I paid about 10 bucks too much by ordering on Amazon. I’m still happy and looking forward to the set. Qlair are fantastic, out of all the groups from that era, they have got to be my favorite. The quality of the music is just so good and they just have such a beautiful ‘girl next door quality’ I really liked. That was the image they pushed back then though. Fortunately all of their releases have been packaged in that archive release, including their 2 video releases, (The Christmas video is good). so its definitely worth getting if your a fan or want to be 😛 Dancing was certainly not a strong point for these groups compared to today, but the vocal ability was often much, much better. If you want a true challenge, try looking for the 3 Qlair photo-books that were released! Those are so incredibly rare. 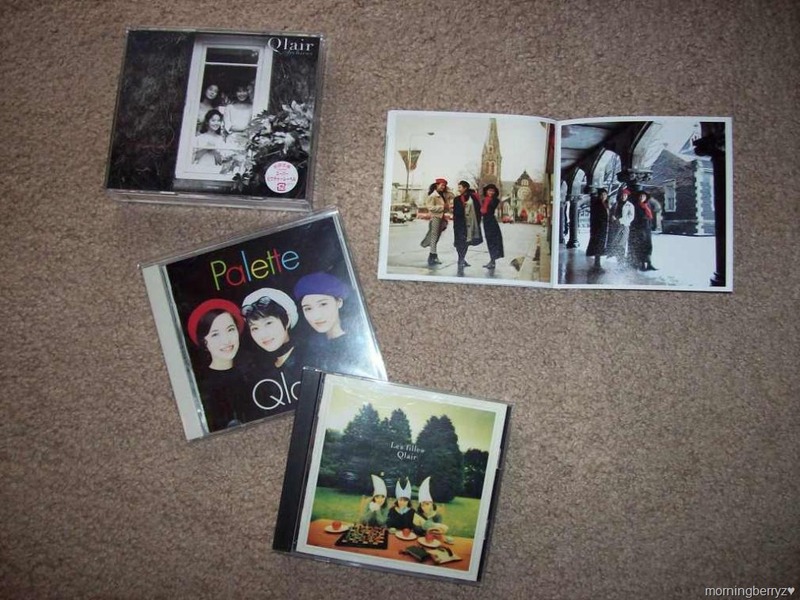 I have a couple of Ribbon photo-books (from Bookoff in Tokyo) and inside one of them was a booklet showing what else was available from the publisher, and it showed some Photo-books from Qlair and Wink, (I didnt know Wink Photo-books existed until I saw that, nothing on the internet about it). Alot of these groups suffered under the enormous popularity of Wink at the time so they were all left to battle it out for 2nd place 😛 Ribbon/CoCo/Qlair/Rakutenshi/BaBe/Mi-Ke just to name a few, so when they faded out I guess not so many noticed since Wink was the top dog… You would think Wink merchandise would be easier to come by due to their overwhelming popularity but that doesn’t seem to be the case, at least for us westerners. I only have one Wink album that popped up on e-bay. If one lived in Japan you could scour all the stores and probably find more, don’t bother asking the Bookoff staff about Qlair though, I tried, they don’t know who they are… 😛 Happy Hunting! U~n! I was most excited when Qlair released their Archives collection as getting a hold of their individual releases proves to be quite the challenge as they’re surely a rarity no doubt! You’ve stated so many excellent points about the then and now of idols and music like how vocals were the central talent focus back in the day while today it’s more of a blend of everything including dancing ability, charisma, singing and of course looks =). Also so true that the music being written during this generation of idol groups was so so superior with rich harmonies and lots of creativity, not to say that the creativity isn’t present today but it’s not quite the same. Un Qlair PBs are a scarce item for sure, I’ve never actually seen one before…,,ditto for Wink with the exception of just one which I once saw at one of our local Japanese book store/video rental places and in hindsight I really should have gotten it but I didn’t then realize what a rarity is was =/. If you’re interested I know where you could purchase Wink releases, there are about 12 albums and 10 singles available as of this comment posting =). There are so few video gems from Qlair but from what’s available this music video is priceless!! ‘Hitomi ippai no natsu” is one of the very best from the golden age of J-pop~♡, just such a perfectly written song with all of those beloved hooks ^^. 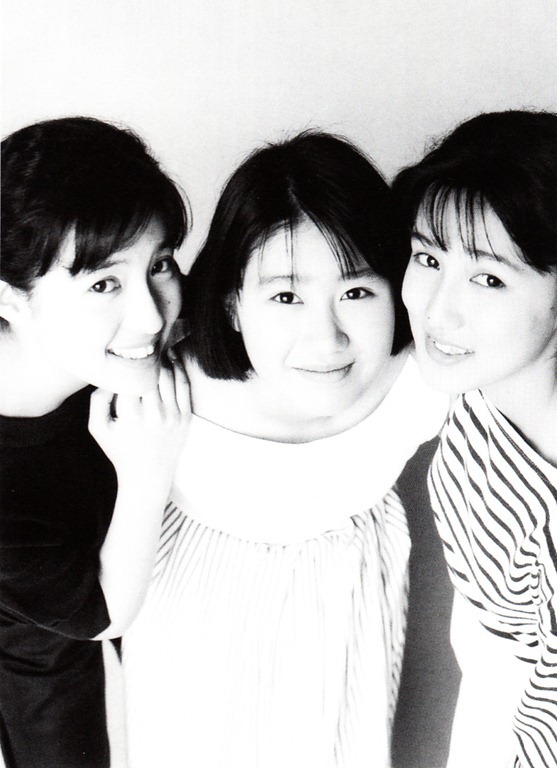 Re: “Hitomi ippai no natsu” was released on July 7th, 1991. Just moved into my new apartment, new town, new job, new car … newly engaged. .. both are truly enchanting songs =). I told myself I was not going to spend 50 smackers on a CD … but then this somehow happened. It is out of print on CD Japan, and there was only a $4 difference between used and new on Amazon, so I bought a new one. I have been listening to a lot of Qlair via YouTube on my iPhone. Several wonderful people have posted Qlair performances, Including multiple performances of “Hitomi ippai no natsu”. There is a Qlair Mix on YT that makes my 40 minute Nu-Step workout a joy. This is one of my favorites. I like this performance because it looks like a tropical Christmas. Also, a cake gets frosted in the middle of the video for some reason. It might not be a holiday song, but I think that I am going to use this as my Christmas card. 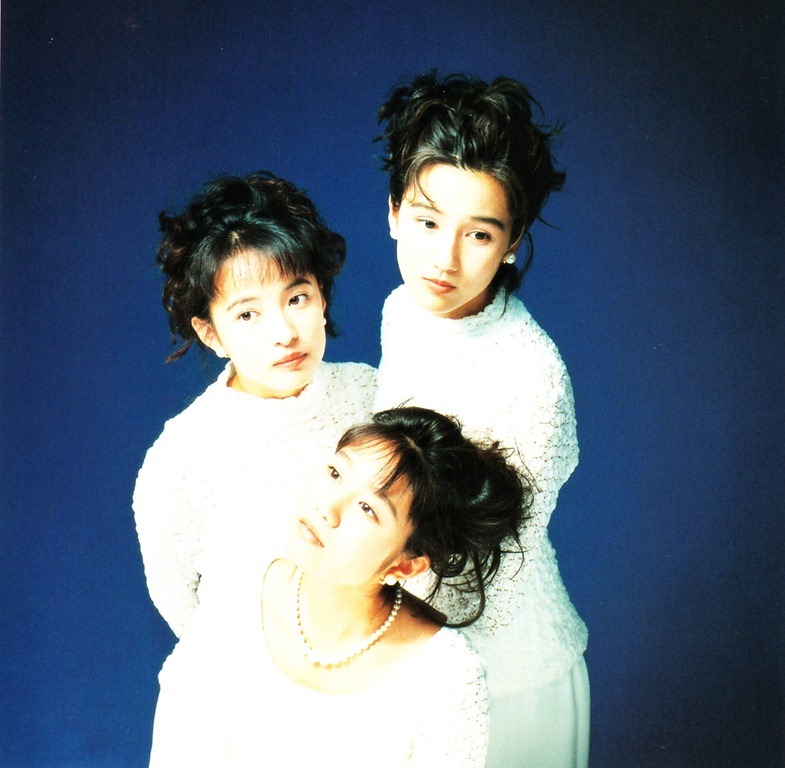 One of the most catchy~♡ and we’ll written songs of the golden J-Pop era!! Its melody is irresistible and Qlair had the very best of vocal talents without question. Awesome to find great Performances like this one!! The cake making was revealed in the DVD movie with those French guys who were really vampires. Or were Qlair the vampires? Or was it all just a dream? UCLA film students should be discussing this one for decades. Just received the package from Japan today! You ordered through Otokichi? His second hand shops offer the very best in the ultra rare and Masa-san’s always ready to search and help track down whatever treasures you are in search of =). Ah I just recalled that you found a seller on Amazon and at a good price, enjoy Qlair…. it’s the perfect collection to own ^^. Yes, I went through Amazon. It was “Pries Japan (Japanese Life Goods)” a seller in Japan. The seller gave me a nice hand written note in Japanese/Kanji script. I should frame it. I watched the DVD and the movie (music videos) that came with it. I have not been that intrigued and confused since David Lynch’s “Mullholland Drive”. Hahaha I too have made reference to this very movie at least a couple of times in posts here as it remains as one of the most cryptically confusing movies of all-time XD! I thought Mr. Lynch a bit pretentious too as he actually included a checklist of stuff to take into consideration while watching and it’s printed on the reverse side of the DVD’s chapter list insert =). Guess what my favorite MD scene was. Hint: I’m a guy. All too easy!! Let’s just say that is was Mmm…. “cryptically gratuitous” and it made me think well maybe if I had been a curious college student “that” could happen =).